We got amazing reactions to our founder’s TED Talk. 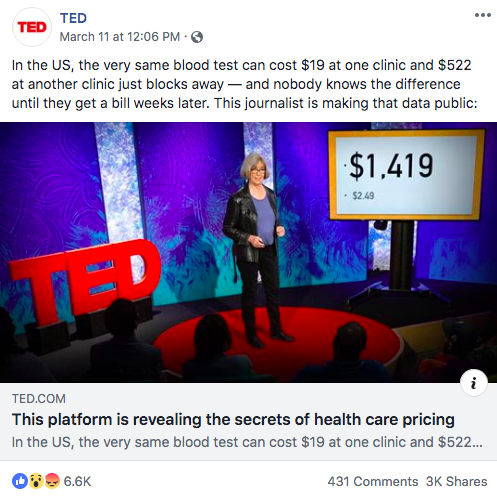 Here’s the TED.com Facebook post on the day it went live, with 800-plus shares and more than 2,000 reactions It was around the top 10 or 20 percent as measured by shares and reactions over the past few weeks. A few weeks later, TED posted about the talk on Facebook again, and it was shared more than 3,000 times. The post got triple the shares of the one from Feb. 20, the day it was on the front page. This is rare and unusual — quite often the first day on the TED front page is your biggest, we are told, but you, our supporters, are making our mission known. Folks, we are genuinely humbled and inspired by your support. And here’s a tweet. It got 753 likes and 335 retweets! Here are some reactions from Facebook, Youtube and Twitter comment streams. “That’s what I’m saying. Anyone who’s ever been or had a relative go to the hospital for any minor accident knows how costly those bills are. And you never even get to compare prices for all this medicine they give you. I’m glad this is happening. “It is the old ‘pea and shell game’. Insurance costs go up, so premiums go up. IT IS COLLUSION. The doctors charge more because many are insured and can claim. With claim costs going up then insurance costs and premiums go up. The trusting public is taken for a ride. As the American saying goes ‘never give a sucker a break’. When your health (and hence income ) depends on the medical service you can afford and you have to have….. Sarah Elizabeth Doug Lindsay, You may find this interesting. “1. What is the name of and where is access for this database? “the problem here is that there is so much corruption ..
28 years ago when we first opened our business and I got pregnant 🤰 had no health insurance.. I was just going to take very good care of myself and walk into the hospital when the time came but everyone begged me to apply for government assistance..
As I wasn’t approved until after the baby was born I received a bill in the mail for her first clinic visit..
As my daughter got older she developed asthma. 3 Er visits and an admission before she was diagnosed.. one of those visits they billed us for 3 nevulizertreatmrnts when she only had one. Later when she was going through treatment for leukemia I saw both the best and the worst of the system..
“From eye glasses to MRIs the billed amount is typically 1000% of the actual cost. I was charged $4700 for an MRI of my knee after a couple of years demanding to know the actual cost I learned it was $354 for capital recovery, rent, interest, utilities, supplies, technician labors, janitorial, allowance for repairs. $4,000 was a royalty payment to a shell company owned by the doctor who owned the MRI clinic — this was treated as a cost just like rent. The $346 balance was the profit earned by the doctor who owned the clinic. This bit of accounting magic allowed the doctor to claim he was only making a 7% profit. “WLRN did the same thing in south florida. “What I don’t get is a that after you pay the big bills, they keep coming back at you with small $5 here $30 there $50 there for the same things a year later! Since they are small and when you call they say it is what it is everyone pay them. Youtube: 4.2K thumbs up, 82 thumbs down. “At one point in my life I was uninsured. I was recommended to get an ultrasound. I asked how much it was. They told me $400. I said I don’t know if I can afford it. They said you don’t have insurance? Oh then it’s $175. I never understood how the same test could have different prices depending on whether or not you were insured. The price should be the price. “The fun part is that the prices change depending on whether or not you have insurance. There’s a cash price and then there’s the insurance price AT THE SAME Doctor! What happens when you have a high deductible insurance plan? The ‘negotiated’ price of the insurance is what you have to pay out of pocket even if the “cash” price is lower. And getting doctors, hospitals and clinics to tell you the actual price is a lesson in frustration. They don’t want to tell you or they say they can’t because the price depends on the price negotiated with the insurance company that you have. And you better know what your insurance covers before you go in for a scheduled procedure, otherwise the hospitals will try to get you to pay, up front, a higher payment than what is necessary from your insurance. Then you get to deal/argue with them for months to get the refund. “My job required me to get a doctor’s note for missing time from work. The immediate Care facility told me the flu test would be $90 based on my insurance. I was given a flu swab check literally a long q-tip into my right nostril. That’s it. (Had the flu) The code used for my treatment was for an extensive checkup, describing all sorts of testing and a physical exam. Later I received a bill for $240 for this test. I contested the bill and was pushed back and forth in between my insurance company and this Dr being told the insurance company decides how much I’ll pay based on my deductible. The Dr said it was against the law for me to pay cash for the bill and not use my insurance at all as to determine the price. I called later that year a requested a price for a flu swab, $26 plus a visit charge of $90. It’s not the amount of money that gets me. “If only this caused doctors/hospitals, etc to charge less. I took my daughter to the ER for a kidney infection. They gave her a UA and a single dose of antibiotics. We were there for less than an hour and my out-of-pocket cost was close to $600!!!! “I love this! Pricing transparency will help a lot (I would hope). I spend a lot of time calling and asking what costs are for appointments and treatments because of how my insurance is set up. I need to know what I’m going to end up paying under Cigna’s negotiated rates. And more places than not can’t tell me… Or won’t. It becomes time consuming. “Most doctors and hospitals are honest, hard working, and truly care for their patients. There are always the bad seed that spoils it for everyone else. I’ve worked in healthcare for over 20 years and we are trying to do the best that we can with limited resources. The vast majority of hospitals are not for profit organizations. They are required to treat patients regardless of ability to pay, they are faced with dwindling Medicaid/ Medicare reimbursements, and they are strangled in regulations. And do you really want the Walmart of healthcare? Cheaper is not always better. I’d look at morbidity and mortality rates, success rates for what I need treatment for, hospital acquired infection rates before I’d even look at price. And the price you see, that’s all a game that insurance companies play, they all negotiate prices for services. And due to all this complexity, hospitals are forced to hire teams of people (coders) to try and weed through all the different red tape to get a bill to you. Coding is one of the fastest growing aspects of healthcare. Teams of people who have no patient contact digging through charting, just so we can send a bill out to the insurance companies. There is something fundamentally wrong when you have for profit companies insuring people. Where do their loyalties lie? It’s not with the people they insure, it’s with their stakeholders. You want more affordable healthcare, make health insurance not for profit and make large pools of healthy people with the ill to even the costs out for everyone. Universal healthcare works all over the developed world, it’s not a new concept and it works. The money that you and your employer currently pay, would just get shifted and we could then afford to cover more people. What??? You mean to tell me that scams & corruption exist in the healthcare field?? You mean they’re exploiting patients & lining their pockets at the expense of the patient?? I’m shocked!! “Absolutely brilliant! I completely agree with her ideas on cost transparency. Nowadays, everyday patients are sent bills after their discharge that they are unable to pay out of pocket. Some people who are injured often refuse to be taken in ambulances to the emergency room because they are afraid of bankruptcy. 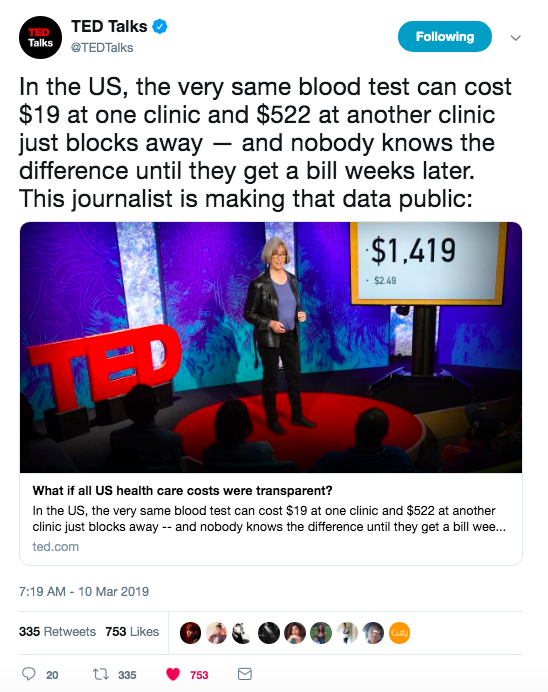 The healthcare system’s goal is to heal, and if making prices more transparent will help in doing that, then I believe this is a conversation worth having in existence. Thank you Jeanne for your ideas and discussion. “The healthcare industry is just like any other big business. Providers will raise their prices as much as they could until the customers say no more and they stop buying the good or service. People just stay in their old houses or apartments, they hold on to their old cars or smart phones for as long as they could or they stop buying new shoes or clothes or eat out less and less. In the case of healthcare, it’s not easy to say no because it’s a matter of life or death or at least pain and suffering. No one wants to die or suffer from pain and healthcare providers and insurance companies know this pretty well. “I live in Canada. Health care is considered a right, not a special privilege for some..Universal healthcare…My parents both died of cancer years ago without benefit of insurance in USA. My dad was told he could live with poor quality of life for one year with leukemia but it would cost $150 000….He said why should I pay that in order to be tortured to death. So he died naturally…. 1978. Coming to Canada was the best decision of my life—for healthcare alone if nothing else. I really feel for my American cousins. It is so easy to slip into foreclosure or bankruptcy due to medical bills. It is strange that the US has made some of the most stunning medical advances in the world yet simple care is not accessible to many. I never had to wait unreasonably in Canada, I have a chronic condition that I could never afford in the USA. I would be dead I guess. Unless I was one of the lucky ones with access. These people finding out the costs in USA are heroes. “As much as I hate the insurance industry, having health insurance should be considered an absolute necessity. You hope that you will never need an operation, however, there is a high probability that you will, especially after the age of 30, need one. At that point, in Australia or New Zealand at least, if you have no insurance you go on a public health waiting list and get treated in a public hospital, usually after a very long wait. With health insurance, you see privately funded health providers and get treated in a private hospital as soon as possible. The price of things really then, is mostly irrelevant, its just a matter of making sure you are appropriately covered. The question comes down to, what risks are you prepared to take, or are forced to take, as regards your wellbeing. “To me, this is what government should be doing, and requiring: clear, transparent pricing of health care services and products. I’ve had so many family members and friends with catastrophic medical bills – always a mystery, always seems like there’s some scam being foisted on helpless patients, always seems shady when some people can get their bills reduced but we can’t. “Transparent healthcare costs is what I’ve been arguing we need for a long time. My dad had to get a CT ended up getting charged more than $4k. Found out there was a hospital down the road 15 min he could have gone to that had new and better equipment which charges less that $2k. “A few days ago (March 31) Canadians drove back from Florida with a dead family member in their car. The father died of cardiac arrest. They could not afford to bring him to a hospital and follow proper protocol. “Several years ago I went to the hospital to have an abscess treated- a 15 minute procedure. First they asked if I had insurance. (no). Then they said they wanted to give me an MRI. I refused based on cost. They insisted. I insisted I could not and would not pay for an MRI to the attending physician as well as the MRI tech. They gave me the MRI. Then they told me to get out of their hospital, untreated. I had no insurance so they were going to leave me with my potentially lethal condition. I told them not to bother sending a bill. They sent a bill. For $8000.00. They never got paid. They never will get paid. Luckily my abscess turned into a fistula rather than killing me. “What if you knew what stuff cost in health care in advance? Jeanne Pinder with @chcosts rocks TED Talks AND a leather jacket. MAD props! “Take away the shadows and force transperancy and Healthcare providers will be forced to compete and lower prices.